I’m not sure how on earth it’s almost Mother’s Day already – didn’t Christmas just happen? 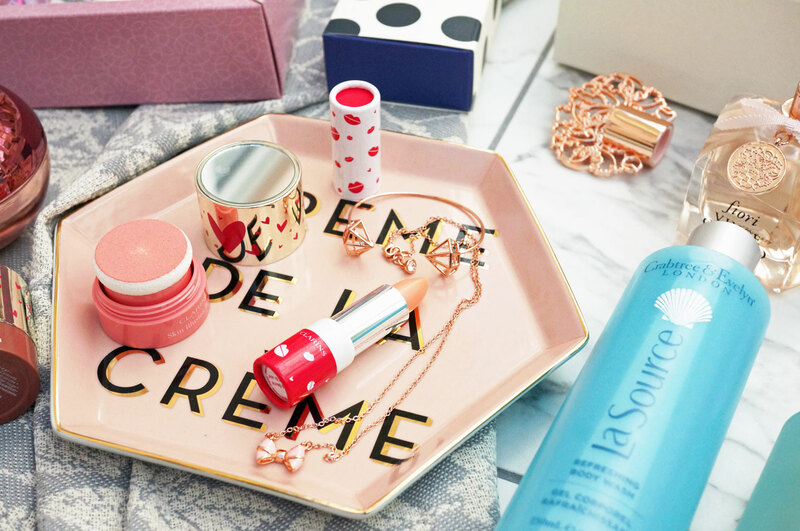 Anyway, Mother’s Day is right around the corner so I thought I’d gather together a few lovely gift ideas to hopefully give you some inspiration. I’ve tried to include a bit of everything here to cover a range of budgets – Enjoy! 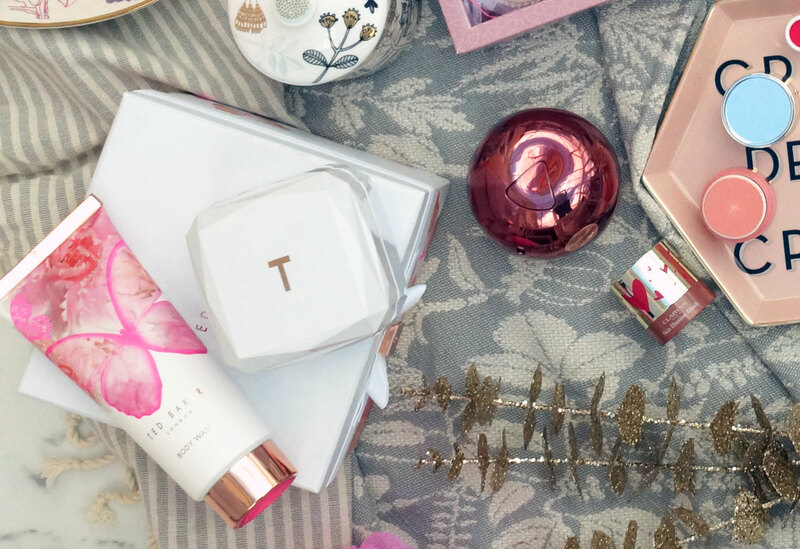 Starting off with some beautiful rose gold jewellery from Ted baker – the Ted Baker Ceanna Cuff Bracelet & Edda Bow Necklace (£17.50 each at Amara) are such good bargains, I had to include them. They’re both half price at the moment (£17.50 rather than £35.00 each) which really is a fantastic bargain. The Ceanna Gem Frame Cuff Bracelet is made from brass with rose gold coloured plating, it features a gem frame design and is enhanced with Swarovski crystal embellishments. And the Edda Bow Necklace also has a rose gold finish, with a super cute baby pink bow pendant. I also had to include the lovely Ted Baker Hat Box Gift Set (£18.00 at Boots) – This decorative hat box contains a 200ml refreshing body wash, a large 250ml shimmering body soufflé and a mini bath scrunchie. The box is also very pretty and would be great to keep or to use for future gifting. 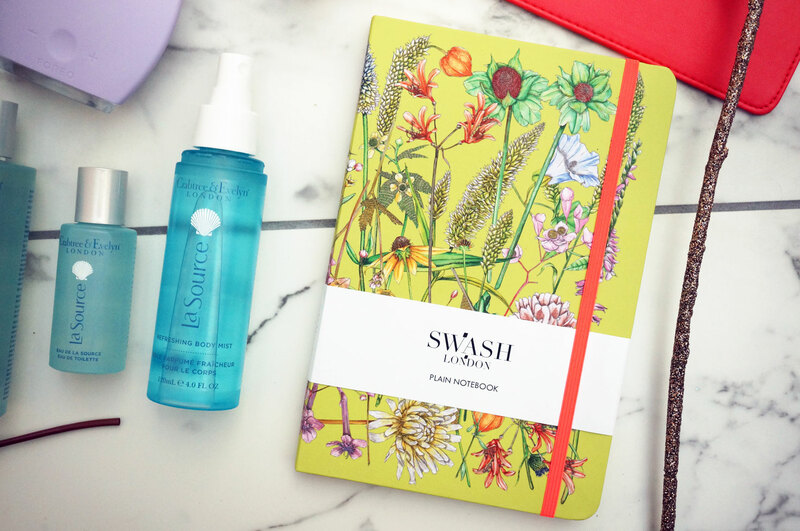 The Swash London Floral Meadow Notebook (£12.50 at Amara) is another half price find in the Amara sale. This fun and colourful notebook has plain pages and a hardback cover, finished with a hot pink elasticated bank closure and a matching ribbon marker. Clarins have also recently brought out some lovely products which would make wonderful Mother’s Day gifts. The Clarins Tender Moments Collection is a mini collection of products in cute, limited edition packaging. The Skin Illusion Blush (£16.00 at Debenhams) is a handy little product that’s perfect to give cheeks a pop of colour. I love the compact style of the packaging, and Clarins has also incorporated a mirror onto the lid which is a really nice touch. The formula contains active plant ingredients which offer added comfort and radiance on application, and I love that the product is super easy to apply with the integrated sponge. And the Daily Energizer Lovely Lip Balm (£16.00 at Feel Unique) – rather than just a bog standard lip balm, this nifty little product contains an ‘intelligent pigment’ which reacts with the lips’ pH to develop a personalised natural pink shade. The balm also promises to repair and nourish whilst the peachy fragrance smells good enough to eat. For Mum’s that like a brew, the Silken Pyramids Selection Box Set (£22.00 at Newby Teas) is the perfect set for branching out into new tea flavours. This luxury selection box is filled with silken pyramids which have been individually wrapped for freshness. There are four beautifully-aromatic infusions to choose from, including: Jasmine Princess, Strawberry & Mango, Hunan Green and Rooibos Orange. 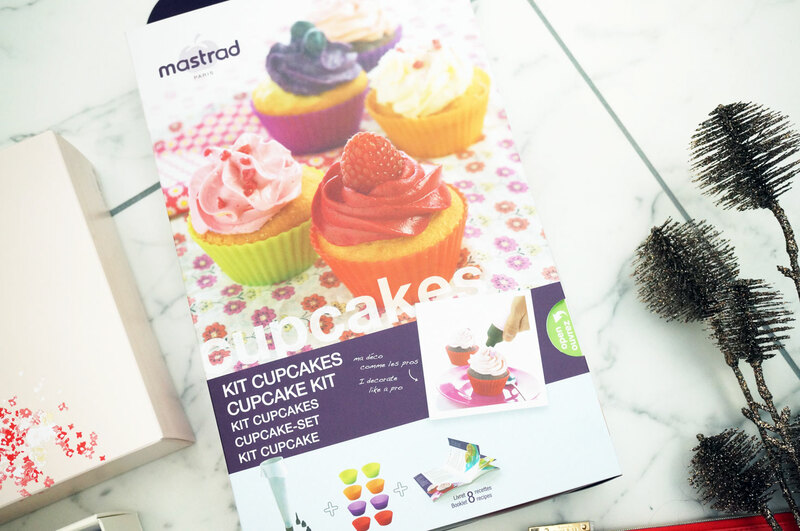 For mums in need of a pamper (hands up!) 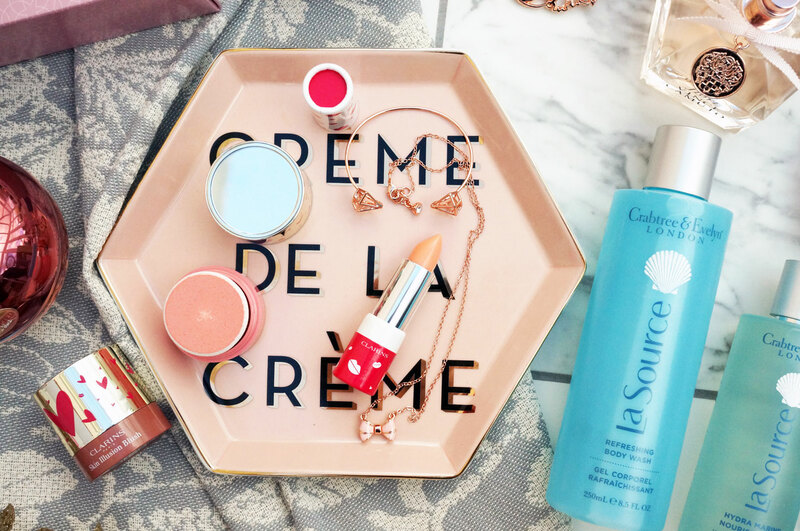 the La Source Collection (from £6.00 at Crabtree & Evelyn) is definitely worth checking out. The La Source collection draws inspiration from the restorative powers of the sea, and is carefully designed to restore, condition and rejuvenate the skin from head to toe. Formulated with a blend of ingredients such as underwater algae, mineral salts and seaweeds the products in this collection allow you to escape everyday life and immerse yourself in spa-like rituals. Of the above products so far I’ve tried the beautiful La Source EDT fragrance, and the Refreshing Body Mist. They both smell wonderfully light and refreshing, and I think any mums in need of some me-time would love to receive these this Mother’s Day. 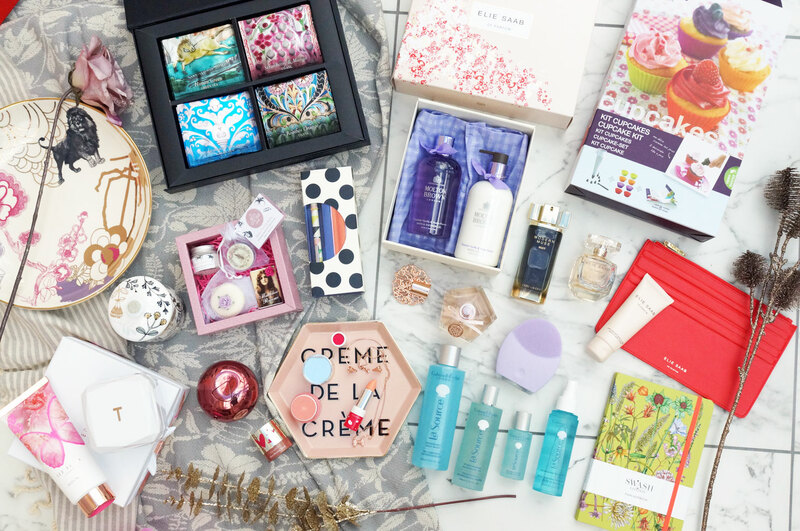 I’m pretty sure I can’t plan a gift guide without including a candle! This Cat Candle (£45.00 from Lush Designs) is just so unusual and striking, I think cat lovers and candle fans would both love it. The candle itself is available in a either lavender or rosemary & watermelon scents, and it’s housed in a wonderful bone china container, decorated with cats and embellished with pure gold lustre. 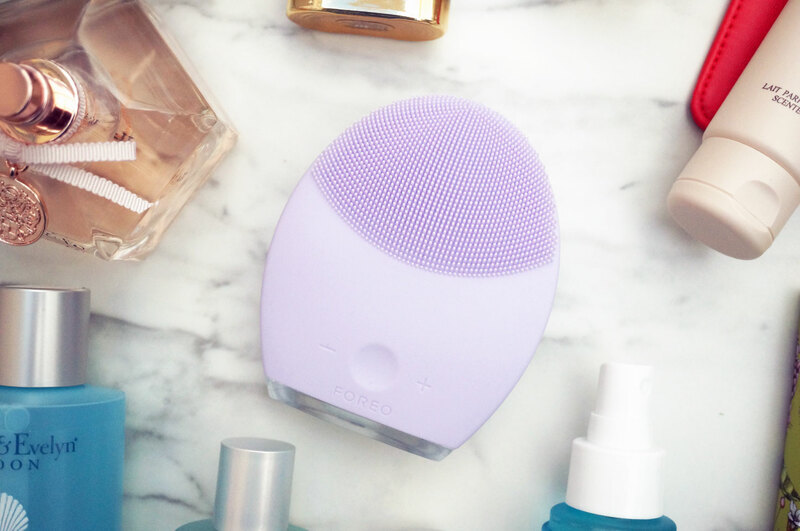 For fans of skincare, the Foreo Luna 2 (£169.00 at Foreo) would make a fantastic gift. It is expensive, but in my opinion it’s worth the splurge when you consider how much use you’d get out of it. The LUNA 2 is an enhanced T-Sonic face brush and anti-aging system that gives you a completely personalized cleansing, and it’s now available with four specialized brush types for a tailor-made skin care experience. I won’t go into too much detail here, but please check out my previous review if you’d like to hear more about the Foreo Luna 2. 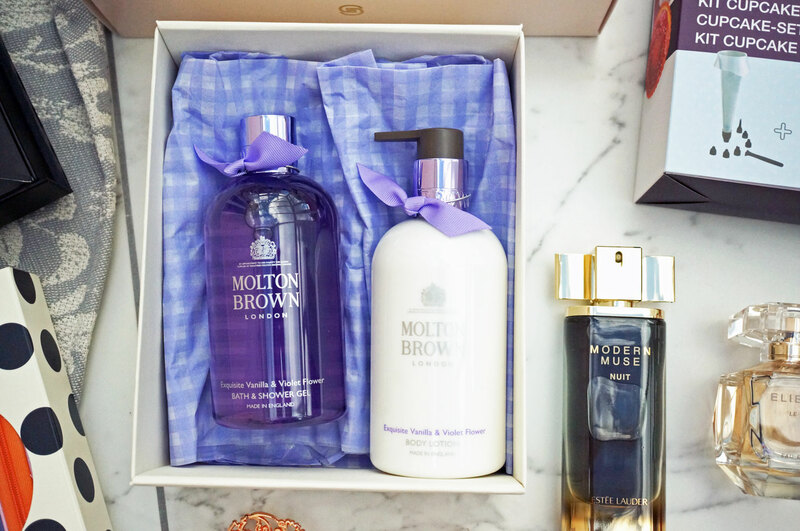 Another one of my favourite brands for gifting is Molton Brown, and their new Exquisite Vanilla & Violet Flower Shower Gel & Lotion Gift Set (£45.00 at Molton Brown) really would make a wonderful Mother’s Day gift. This limited edition bath and body set blends notes of creamy vanilla over delicate floral scents of violet flower and orris, to create a stunning fragrance. The set is presented with a grosgrain bow and violet-hued metallic caps in an exquisite limited edition Mother’s Day gift box. For a budget option, this Exquisite Choices Gift Set (£12.95 at Pretty Little Treats) is just so girly and pretty. 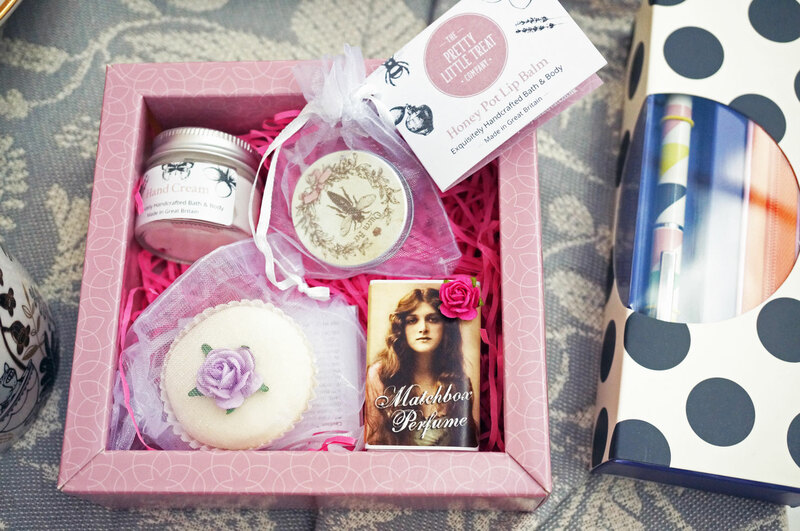 The handcrafted set contains four pampering treats: a mini pot of hand cream, a lip balm, a bath treat, and a matchbox solid perfume bar. 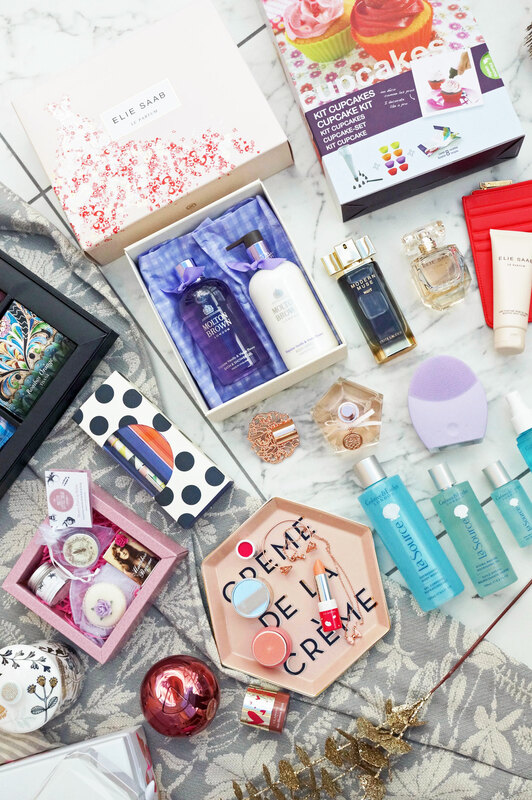 The products are all beautifully packaged, and presented in a luxury box which is perfect for gifting. On to fragrance now, DKNY Be Tempted Eau So Blush (£50.00 for 50ml at Look Fantastic) is a wonderfully fresh and sparkling fragrance that’s perfect for Spring. Be Tempted Eau So Blush opens with an invigorating blend of Pink Grapefruit infused with juicy Blood Orange and succulent Red Currant, whetting the appetite with mouthwatering notes. With a playful allure, Pink Peony, sensual Jasmine and Cedar Wood at the heart lead to a base of rich Creamy Woods, Apricot and Musk. Top Notes: Pink Grapefruit, Blood Orange, Magnolia and Red Currant. Heart Notes: Peony, Jasmine and Cedarwood. Base Notes: Creamy Woods, Apricot and Musk. I’ve also included Estee Lauder Modern Muse Nuit EDP (£70.00 at Debenhams)- this floral woody oriental scent blends sophisticated floral tones with creamy woods to create a beautiful contrasting accord that is lushly vibrant yet luxuriously warm. More of an evening fragrance than the original Modern Muse, this scent is opulent, glamorous and sensual. Top Notes: Mandarin and Bourgeon de Cassis. Heart Notes: Chamomile, Jasmine Absolute, Jasmine Sambac China and Heliotrope. Base Notes: Sandalwood, Clearwood, Tonka Beans, Madagascar Vanilla, Musks and Amber. And I had to include this Elie Saab Le Parfum Gift Set (£49.30 at Escentual) – I’m a massive fan of Elie Saab fragrances so I think this Le Parfum gift set would make a wonderful present for Mother’s Day. If you’re not familiar with the scent, Le Parfum is a beautiful, voluptuous and feminine fragrance. It opens with a radiant Orange Blossom, leading to a heart of elegant Jasmine Absolute, combining with a pure, modern Patchouli. The base note unfolds into a Cedar Woody Accord adding character and a lingering trail, while the Honey Rose envelops the composition in a beautifully addictive note. 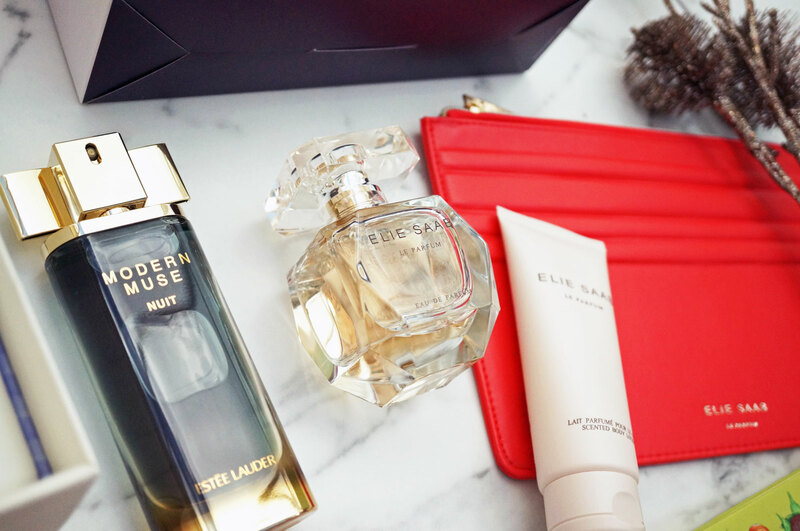 The gift set includes: Le Parfum EDP 50ml, Le Parfum Scented Body Lotion 50ml, and an Elie Saab Red Clutch Bag. Heart Notes: Jasmine Absolute and Patchouli. Base Notes: Clear Woods and Honey Rose. And lastly, I also wanted to show you this stunning fragrance from Vince Camuto: Fiori (£55.00 at Debenhams). I just love Vince Camuto bottles, they’s so striking and would look just wonderful displayed on a dressing table. Fiori (meaning Flowers in Italian) is a fresh, light and uplifting fragrance featuring top notes of luscious Pink Grapefruit and ripened White Nectarine, a heart of sheer Iris and dewy Freesia, leading to a base of rich Sandalwood and creamy Blonde Cedarwood. Heart Notes: Iris and Freesia. Base Notes: Sandalwood and Blonde Cedarwood.